GM Europe's Forster says talks on Opel's future could last 6 months. MUNICH/TURIN - Fiat declined to comment today on a newspaper report that it could make a new bid for Opel. The newspaper also said China's Beijing Automotive Industry Corp (BAIC), which makes Mercedes-Benz cars in Beijing in a joint venture with Daimler, could also bid again. Germany has stressed that other bidders, including Fiat and BAIC, still would have a shot if they improved their bids. "The process is still open to all the bidders," government spokesman Ulrich Wilhelm told reporters in Berlin on Wednesday. After being criticized for doing nothing to help Fiat's bid, Italian Prime Minister Silvio Berlusconi said on Wednesday his government would be willing to intervene with Germany to support another Fiat bid if the automaker wanted. The German government has an interest in keeping up the pressure on Magna until a deal is closed that fully satisfies Berlin's demands. In an interview published Thursday, GM Europe President and Opel chairman Carl-Peter Forster said he hopes that Opel will make a profit before a 2013 target set by Magna. Magna Chairman Frank Stronach has predicted that Opel would break even in three years and turn a profit in four years. Forster said his “full ambition has been aroused" by Stronach's remarks. "We will do everything we can to make a profit before 2013," he told Germany's Bild newspaper. 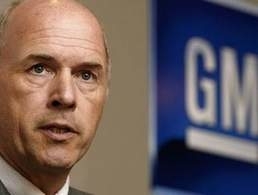 Forster declined to comment on reports that GM Europe will lose up to $3 billion this year, saying that "predictions are impossible in times like these." Opel on Tuesday received the first 300 million euro ($425 million) installment of a bridging loan granted by the German government to keep the company afloat while discussions continue with Magna. Forster said the bridging finance will last until talks to seal a deal with Magna are completed and that could take six months. “Our business is going well, our market share is climbing and we have sold 120,000 Insignias,” he said. At present, there is no risk of Opel going broke, Forster told Bild. GM aims to quickly hammer out a final deal under which Magna would take a 20 percent stake in Opel and Magna's Russian partner Sberbank would buy another 35 percent. GM would keep a 35 percent stake and the remaining 10 percent would go to Opel's 55,000 European employees.